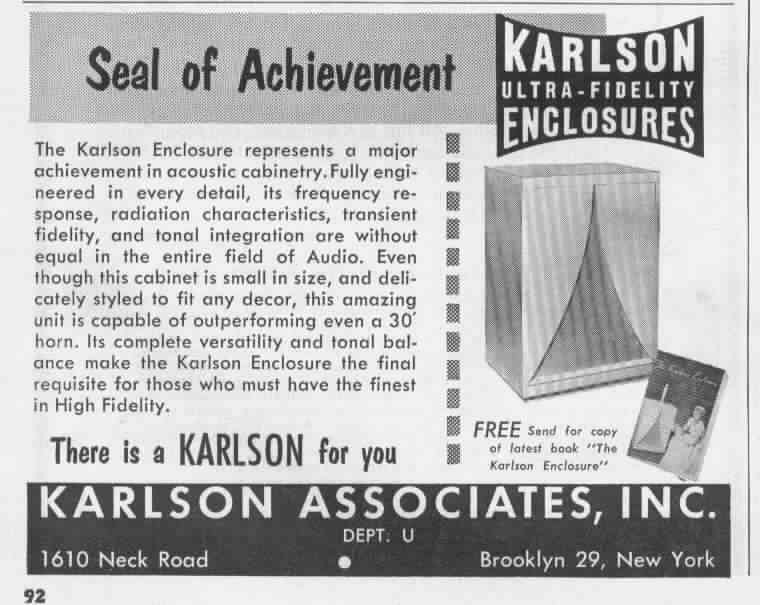 If you're interested in experiments Paul Klipsch did in regards to the 2 speakers + a fill speaker in the center playback track down the Journal of Audio Engineering Society April 1958, Volume 6, Number 2 issue; it has an article Klipsch wrote up concerning some things he tried out. I have a copy of the article in Dope From Hope, a newsletter sent out to dealers regarding the Klipsch line and what PK and his folks were up to in their Arkansas production site. I sold my McIntosh C28 back in 1990, but my long-term recollection is that it had some sort of center channel capability. Can anybody confirm that? Added reverb, actually. The original tapes were recorded dry. Used one of the chambers at the Capitol Tower. Same quality of reverb just not so much of it. More of a 1953 reverb sound and level than a 1960 reverb level (if that makes any sense). The 1953 Capitol reverb balance level is just perfect in my opinion. Makes sense, and in general I agree. That Melrose stuff around 1953-55 pretty much always had the echo levels dead on. Wasn't as great of an echo chamber as the ones they built at the Tower, but its use in the mix pretty much always sounded right. John Palladino told me that when he worked at Melrose, he never went up to the roof to see the echo chamber there. Probably had a tech to take care of the chamber. At the Tower they have an Echo Tech (basically a 24 hour maintenance guy). Those chambers are spooky. Listen to the echo sound (and level/ratio to music) on Frank Sinatra's SONGS FOR YOUNG LOVERS. Just about perfect. I use that as my benchmark for all things echo. I think so, yes. Bunch of receivers did then but I don't think it ever worked. Really screwed up the balance of stereo mixes. 1. Someone asked about Bunny Robyn recording Fats Domino in LA at Master Recorders. I'm not sure how many times Fats recorded there, mostly he recorded in New Orleans. I do know that quite a few of the earlier tracks (by Fats Domino and others) recorded by Cosimo in New Orleans were dry (no effects) and the tapes were sent to Bunny in LA to put echo chamber on them for release on Imperial Records. 3. Lastly, in regards to the actual CONCEPT of 3-channel recordings, I know that the few times I've heard proper 3-channel stereo imaging it was by far the most lifelike stereo imaging I've ever heard, with my own two ears.... Paul McManus had a setup at his house a long time ago where he played me a 3-track master tape from an Ampex 300-3 through his Universal Audio board into 3 Altec 604's, set up very properly for imaging--it was an experience I won't forget. I'm guessing due to cost, and consumer electronics manufacturers pressure, and probably the very real impossibility of cutting 3-channel L-C-R grooves on a record, this idea was scrapped, but I have to think the inventors thought it was the stereo imaging of the future when they invented it. .crystalised. and Mister Charlie like this. I presume Master Recorders was another studio which, on 45 lacquers cut on Scully lathes, used the 2-pitch lead-out groove followed by a turn or two of catch groove before reaching the concentric locked groove? And which other labels besides Imperial used Master Recorders-cut lacquers? Liberty and Dot, perhaps? There is so little known about Bunny Robyn, and I'm not sure I've ever seen a photo of the studio control room at Master Recorders. Somewhere I'd like to think the Robyn family has a file cabinet of photos and such, but I doubt it. The story I heard about why Master Recorders closed (and please, somebody correct me if I'm wrong, this is just a rumor) is that one of the east coast record companies didn't like the competition and so they booked Master Recorders on a lockout. Even though he was making money, Bunny just sat around not doing anything, and so after a couple years of this arrangement, he closed the studio. I'm assuming that Master Recorders had a Scully lathe and cut the lacquers for all the West Coast Imperial and Specialty stuff, but again, I've never seen a picture of a lathe at Master Recorders, so I don't know. Gold Star had a pair of Scully lathes, Capitol had Scully lathes, I've never seen pictures of any cutting lathes at Radio Recorders, Liberty Recorders, United-Western, the Annex, American Studios etc but obviously they had them. I'm just not sure what they were because I've never seen photos. Did Dot have their own LA studios? I've never heard that, if they did. I know they had offices at Sunset and Vine. I know Radio Recorders (and their Annex which was later spun off into the unaffiliated Annex Studios) had Scullys, as did United/Western. I'm pretty much able to tell who cut which by numerous variables. Gold Star must've used pre-1950 Scullys by what I've seen of the lead-in and lead-out spacing. Capitol, there're a hundred threads on this forum about this very issue. As for Dot, to my knowledge they never had their own studios. They largely used others, i.e. Radio Recorders, the Annex, United/Western, RCA's two "Music Centers of the World" (Sunset and Vine and later Sunset and Ivar), probably Liberty and maybe Gold Star as well. On both Liberty and Imperial (after the former took over the latter), I've seen lacquers from "other" sources - namely United/Western, RCA Hollywood (on Si Zentner's "Up A Lazy River" single), and Annex Studios (on The Hollies' "Stop Stop Stop" single); and LP's cut at Columbia's Hollywood studios. .crystalised. and Deke Dickerson like this. I should also add that Electro-Vox studios on Melrose (almost directly across from the original Capitol Melrose studios) had a mastering room in the back. There were about 4-5 of these very primitive lathes from the 30's, made by and imprinted with the original owner's last name-- Gottschallk if I remember correctly. They were mono and were equipped with RCA cutting heads. In the mid-1990's I had an opportunity to buy them at 500 a pop, I declined. Electro-Vox did cut a lot of small independent records, including at least one small hit, "You Cheated" by the Shields. I Love Music likes this. Can anyone confirm how reverb was applied to recordings made at Bradley's studio? From what I've heard of Patsy Cline, Burl Ives, Brenda Lee, Bobby Helms, etc., it seems as if only the center channel (vocalist) received live reverb on the three-track, and then reverb was applied to everything later, during a two-track reduction for a stereo compilation. The band tracks sound dry when sourced from three-track versus two-track, the latter being much wetter and containing more distortion (and extra reverb on the vocals because it was already "live" on the center channel). The mono mixes from Bradley in that era are much dryer. When I listen to a stereo mix of any era, I actually prefer mono reverb on the vocalist only, rather than stereo reverb clear across; it gives a spotlight to the performer that is impactful and emotional. That seems to be a trademark of the Bradley sound. The only true three-track recordings I've heard are what Steve did for the AP Nat King Cole SACDs, but I agree, there is some imaging magic there. The phantom illusion is strong and gets 90% of the way there, but there's something to be said for hearing music recorded to three-track with three actual speakers. When I listen to a stereo mix of any era, I actually prefer mono reverb on the vocalist only rather than stereo reverb clear across; it gives a spotlight to the performer that is impactful and emotional. That seems to be a trademark of the Bradley sound. The only real three-track recordings I heard are what Steve did for the AP Nat King Cole SACDs, but I agree, there is some imaging magic there. The phantom illusion is strong and gets 90% of the way there, but there's something to be said for hearing music in three discrete channels. Then why is Patsy Cline's Greatest Hits drowned in reverb compared to Patsy Cline Showcase, for example? Is that because the GH compilation came out in the late 60s and listeners wanted more reverb to suit the times? Greatest Hits dub tape prepared in New York. Sounds terrible. Totally different story. I'm speaking of anything that was recorded at Bradley in 1958-65 (or even Decca NYC for that matter). Those albums were cut direct from the threes. Company policy. Stuff from LA studios (like Rick Nelson) were mixed at Western to two channel and LPs cut from those. Eventually everything was cut from the standard two. It's funny (well, not "ha ha" funny, but interesting) that when the HI-FI era started (February, 1953), the major record labels were upstaged by the upstart Mercury and their ambiance filled one microphone "Mercury Living Presence" classical series as engineered by New York recording wiz Bob Fine. This mean that the major labels were all of a sudden scrambling to find BIG spaces to record in. The old unconsecrated churches, ballrooms, masonic temples, etc. that the major labels came up with to get natural echo meant a complete change in their philosophy of recorded sound. In the 1940's, ALL music, pop and classical had a dry sound, like movie soundtracks. You were expect to "add" the ambiance when the sound hit YOUR listening room. The Hi-Fi craze meant realism and all of the record companies needed echo FAST! While they were scrambling, an engineer was scratching his head and thinking: "Instead of finding a building that had big echo in it, why don't we just build an echo chamber instead?" So, he did, at his Universal Recording in Chicago, Bill Putnam built a tiled room for echo that looked like a giant bathroom consisting of a loudspeaker and microphone at the other end of the room. This could be piped in to the dry signal at will and sounded darn convincing. Thus, the echo chamber was born. When Bill Putnam moved to Los Angeles he built the famous United Recording in Hollywood. By that time he had seen his "echo chamber" idea spread across the country and indeed around the world. Listen to any early Bo Diddley or Chess recording from the early 1950's and you will hear Bill Putnam's original echo chamber in use. One of the giants of the recording industry. What happened in February 1953? Ah, makes sense, thanks. That would explain why some sessions from Sentimentally Yours sound better in mono because there was too much reverb mixed live to three track. Why'd the Decca bosses feel the need to make a NY dub tape for GH? And why did Analogue Productions use it again for the audiophile reissue? It's frustrating. I've always preferred your less-is-more approach to reverb. Nat's "Ramblin' Rose" is a great example of your good work. Three giant horns placed directly in front of the mixing board. Wouldn't that shear the poor engineer's head off? It's how I feel when I play something mastered too brightly on my system.